We have examined how the ‘Ananda’ poise of Reality (Sachchidananda) that manifests as Divine Love and Bliss is difficult to be perceived by the ordinary human being. In fact, any attempt to contact the Ananda or Bliss-principle aspect of Reality might be counter-productive unless one has the experience of identifying with the inmost essence of one’s consciousness-- the ego–surpassing fourth dimensional principle named by Sri Aurobindo as the Psychic Being. The ordinary human being reacts to the stimuli of life with the triple response of pain, pleasure and indifference. This is a superficial response to the shocks of life but also man’s INITIAL response in creation. It is only through developing a technology of consciousness that one can go behind this initial and superficial response. We shall first attempt to understand this external response in terms familiar to the ordinary mentality. 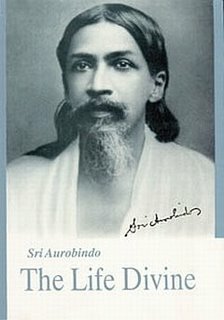 Why does Sri Aurobindo select ‘PAIN-PLEASURE-INDIFFERENCE’ as the triple vibration to which we are subjected on exposure to the shocks of existence? Sri Aurobindo does not select these responses in a casual manner. IN FACT, HE SELECTS THEM SPECIFICALLY BECAUSE THEY REPRESENT THREE DISTINCT RESPONSES THAT ARISE AT THREE LEVELS OF MANIFESTATION THAT APPEAR SUCCESSIVELY IN THE EVOLUTION OF CONSCIOUSNESS. THIS IS THE LEVEL THAT MANIFESTS WHEN THE PHYSICAL CONSCIOUSNESS (REPRESENTING THE MATTER-PRINCIPLE) IS PERMEATED BY THE LIFE-ENERGY (OR VITAL) TO FORM THE BASIS OF OUR BODILY LIFE. IT IS IN THIS PLANE PERMEATED BY THE NEURAL NETWORK THAT PAIN MAKES ITS INITIAL APPEARANCE. Pain cannot manifest unless the purely physical world is permeated by life-energy .Pain is not only a physical suffering; it is accompanied by emotional and/or mental distress. Psychophysiology explains how pain impulses enter the spinal cord and are transmitted to the brainstem and thalamus. It also explains how the perception of pain varies enormously among individuals, being conditioned by past experiences, cultural attitudes, gender stereotypes, genetic make-up and Hatha yogic practices. It is no wonder that the inadequate management of pain is one of the leading causes for active euthanasia- a phenomenon that is in direct conflict with the ‘Ananda’ aspect of Reality! In Sri Aurobindo’s classification of the planes and ranges of consciousness, it is the ‘ VITAL PHYSICAL’ (also known as nervous being), which is enmeshed in ‘the reactions, desires, needs, sensations of the body’ (Letters on Yoga, Tome One, pg332). The vital-physical is the hallmark of our bodily-life and is that aspect of consciousness (in Yoga psychology) that mediates our pain. However, the body is accustomed to fixed habits. Its unique characteristic is its resistance to change. This is quite understandable. If we were made up of only subtle things like emotions and ideas, we would be an amorphous mass of confusion! Nature had to make a formation that is durable, that can withstand disruptive forces, that does not fluctuate with the rapidity and fluidity of emotions and ideas. Naturally, such a formation as our physical body must have a ‘certain fixedness’ that our emotions and ideas lack. Unfortunately, this ‘fixedness’ and ‘rigidity’ can lead to ‘a false impression of absoluteness’ (The Life Divine, pg 116). This is how certain bodily characteristics (notably pain) can become a habit of our nature. Things become more complicated when our chronic habits sink into the ‘subconscious’ (the Freudian Unconscious) to have the capacity to bounce back at other times in life, leading to relapses and exacerbation of old habits! Fortunately, this is not the end of the world. There are higher planes of consciousness that manifest once the bodily life is stabilized. These higher planes like the plane of ‘mind’ are capable of more flexibility and variation and can break the fixity of bodily habits! Level 2 is the level of our emotional repertoire (designated by Sri Aurobindo as VITAL) that manifests once bodily life is stabilized. Of course, the bodily life necessitated a permeation of Matter by the life-force of the Vital. But the full efflorescence of the Vital that we see in human beings (in contrast to forms of animal life below the human being in evolution) is a unique manifestation. This is the plane of consciousness, which contains all our dynamism, our passions, our desires, lusts, longings, our will, our zeal to build, construct as well as to destroy. This is the level from which our SENSATION OF PLEASURE ARISES. Naturally, there is a gradation of pleasures. There is the pleasure of our sensual satisfaction when the reactions of our bodily senses (in Level 1) are invested with emotional values (from Level 2). There are higher ‘pleasures’ which are characteristic of Level 2: the joy of success; the pleasure of our fortunes; the pleasure of satisfaction of our greed, desires, ambitions and even altruisms; the pleasures we get from our emotional transactions with our fellow-beings. Level 3 is the level of the cognitive mind, which manifests when our vital (Level 2) is optimally stabilized on the foundation of our bodily life (Level 1). This is the level of our ideas, thoughts, speculations, conceptions and abstractions. Unfortunately, this is also the level from which doubts, skepticism, faithlessness and pessimism arise. This can result in a mental INDIFFERENCE as a response to the shocks of life. Such ‘INDIFFERENCE’ should not be confused with the detachment and equanimity of the Yogis, which is an altogether different thing. The superficial sensation of indifference is quite evident when we are demoralized, demotivated, depressed; become subject to boredom, alienation and meaninglessness in life. It is characteristic of low self-esteem --an attitude that we cannot disregard if we consider the WHO estimate that by the end of the first quarter of the twenty-first century, depression per se is expected to emerge as the second chronic disease in the world! Ironically, the reaction of ‘indifference’ is even demonstrated in the shift of the universal substance of abuse from hallucinogens like LSD to opioids like heroin. LSD gave romantic feelings- perceptions changed and became impregnated with colours and meanings. Heroin, on the other hand, does not give any colourful experience but ‘zombie-like’ feeling of ‘indifference so that the addict can be cut off from the banality of the world! Can the trio of ‘pain-pleasure-indifference’ be surpassed? 1) The triple vibration of ‘pain-pleasure-indifference’ is just an obligation of habit. Habits can also be changed or substituted. This is what Behaviour therapy and Cognitive-Behaviour therapy attempt in counseling sessions. 2) One can be trained to return the opposite response: ‘ pleasure where we used to have pain, pain where we used to have pleasure’ (The Life Divine, pg115). That is how during altered states of consciousness, one can jump on a bed of thorns or walk through fire or pierce oneself with a weapon without having pain or bleeding. a) responsible for the placebo reaction – the psychological factor that is the real therapeutic motivator in any treatment. b) The analgesia produced by acupuncture and allied therapies. In other words, the ‘mind’ itself can relieve pain of the body by influencing the production of endogenous opioids. 3) The mind represents a plane of consciousness that is free and flexible in comparison to the rigidity of the body and turbulence of the emotions. The mind has been devised for ‘flexibility and variation, for change and progress’ (Ibid, pg 116).It is not bound by our usual habitual reactions. If man can learn to free the mind from our physical habits and emotional turbulences, ‘He becomes the master of his own responses to the worlds contacts, no longer the slave of external touches’ (Ibid). As to why this delight of existence became ‘perverted ‘ and distorted, and how it can be again rediscovered so that it becomes possible ‘to accustom the superficial being to return instead of the mechanical reactions of pleasure, pain and indifference that free reply of inalienable delight which is the constant experience of the true and vast Bliss-Self within us’ (Ibid, pg. 115); we have to have an idea of the depths and heights of consciousness that are accessible to the deeper ranges of our being . That is why Sri Aurobindo introduces the structure of the human being later in this chapter . Withhold from thee the body of God’s bliss.